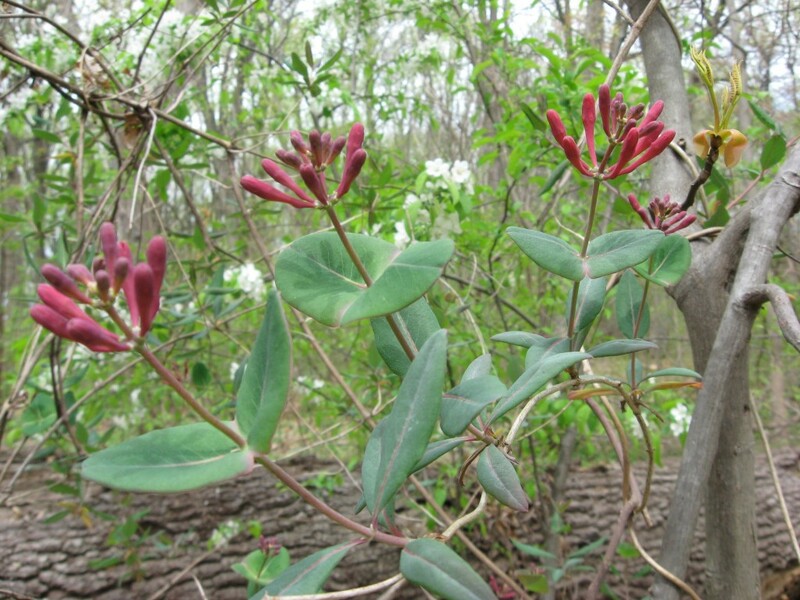 Amidst a sea of the invasive Japanese honeysuckle is found a jewel in the park. Growing in an area that has lost much of its tall trees, where there is more sun, the coral honeysuckle climbs up just a few trees. 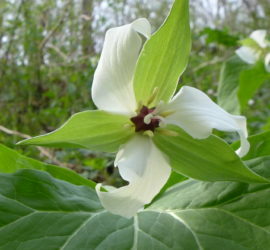 The fused leaf just below the flower is a distinctive quality of the vine. A great garden specimen, this plant is available in at plant nurseries. 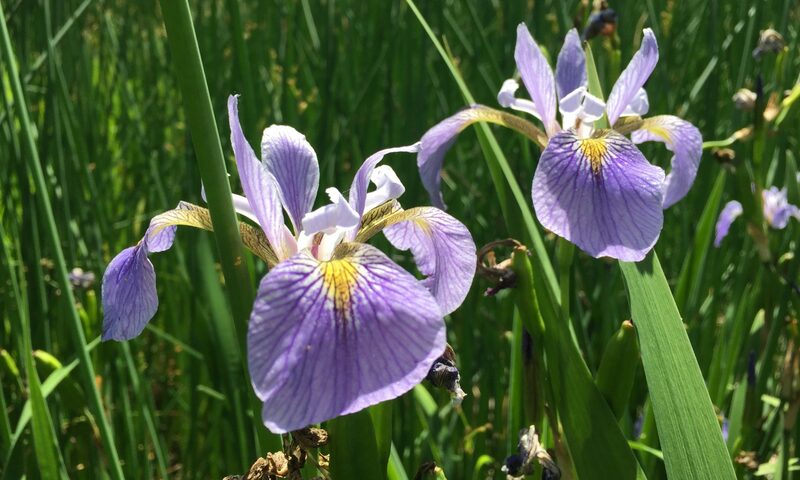 It can flower all summer long if it is planted in a good location. This vine also attracts hummingbirds. They do not have the aroma of the Japanese Honeysuckle, however its many other qualities more than make up for that. 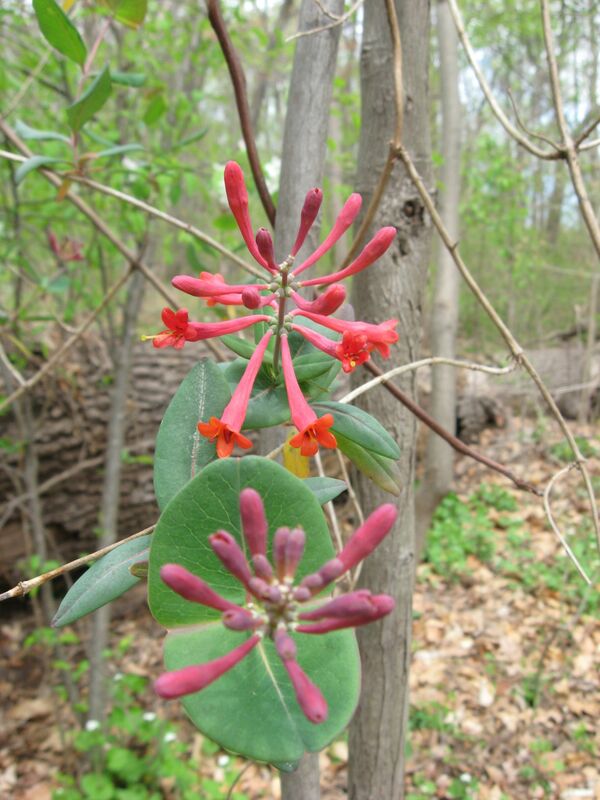 We had the Japanese honeysuckle in our yard growing up the fence. After ripping it out and planting the native one, we got more flowering and the hummingbirds. Somewhere there is a family of them now planning the 1000 + mile trip up to Philly this spring so they can live near our vine. Choose a sunny spot for your contribution to the hummingbird ecosystem. 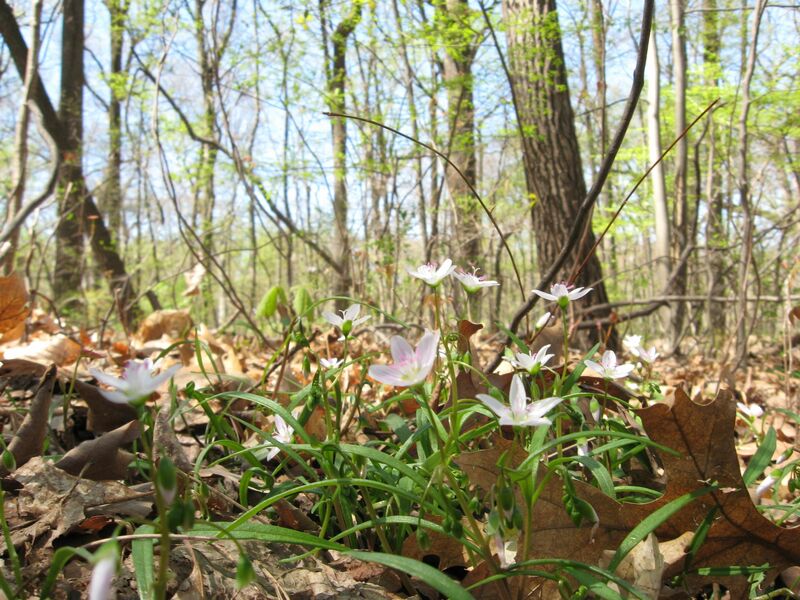 This beautiful native woodland spring ephemeral flower is growing in abundance in Morris Park. 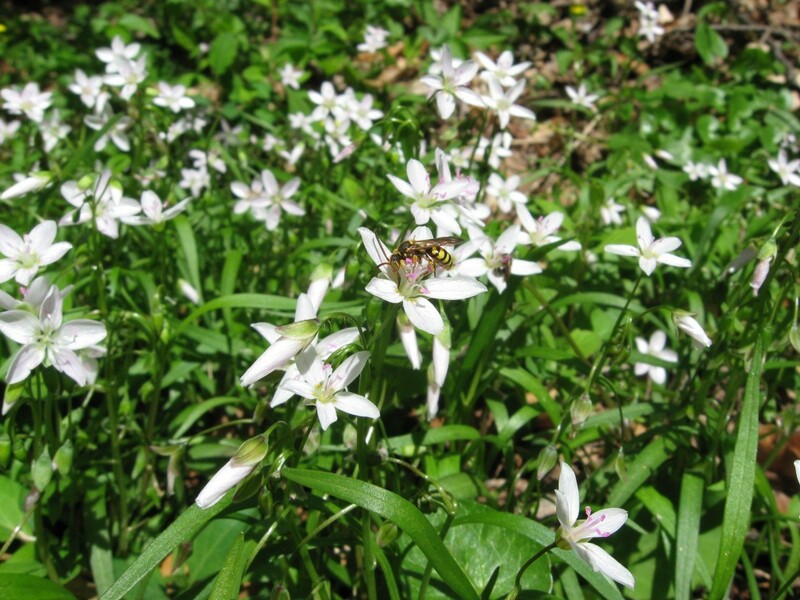 It is in peak bloom, with hillsides covered in white flowers with thin pink stripes. 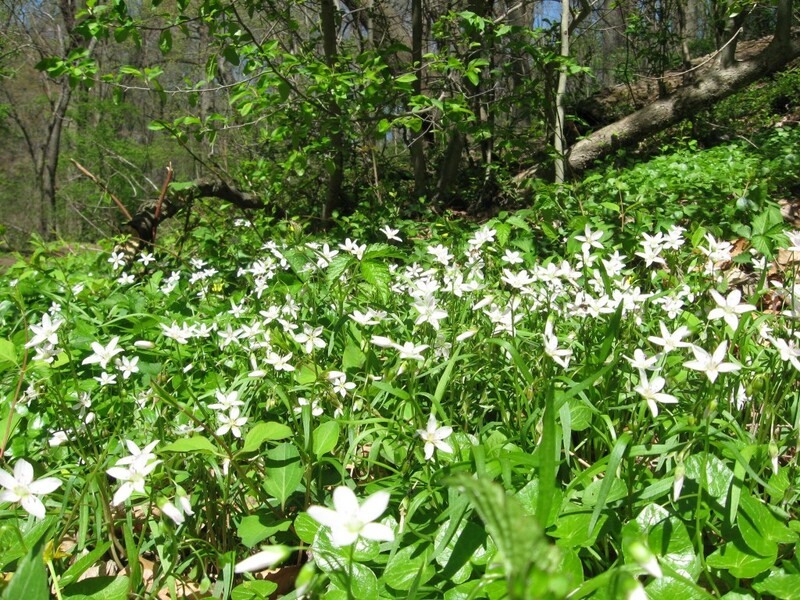 If you live in the neighborhood or nearby, come on out and visit this natural treasure! 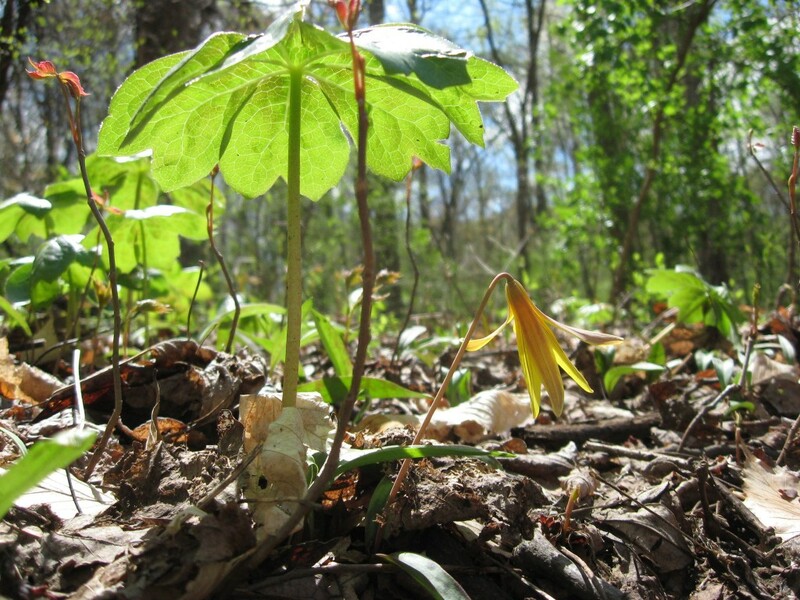 If you are out of state, see if you have them in your natural area, on your lawn or in your woodland. 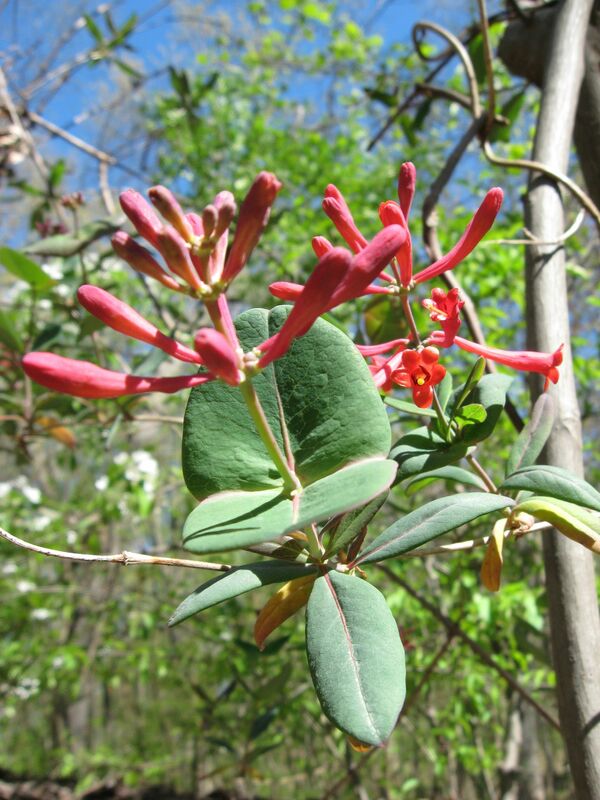 A great garden specimen, this plant is available at native plant nurseries and plant sales in our area. This lunchtime walk in Morris Park was enchanting, with blooming flowers at every turn. 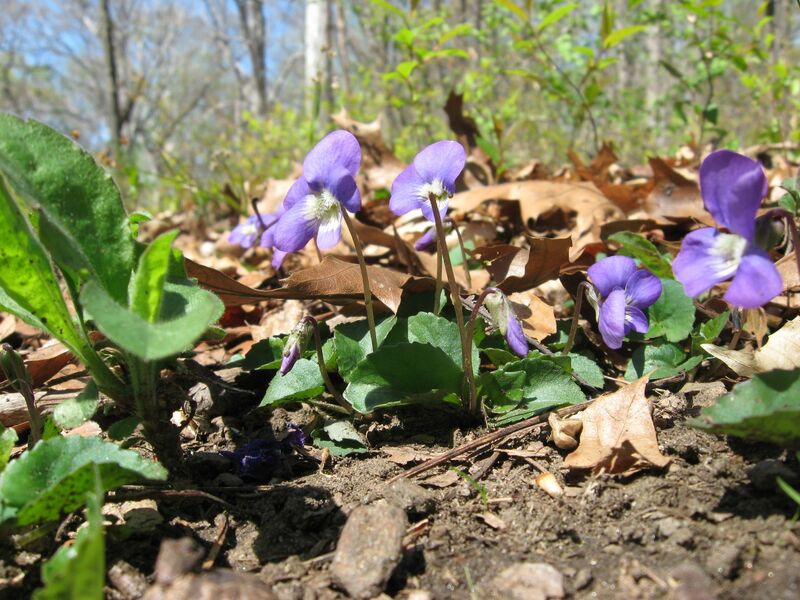 The violets are also blooming. 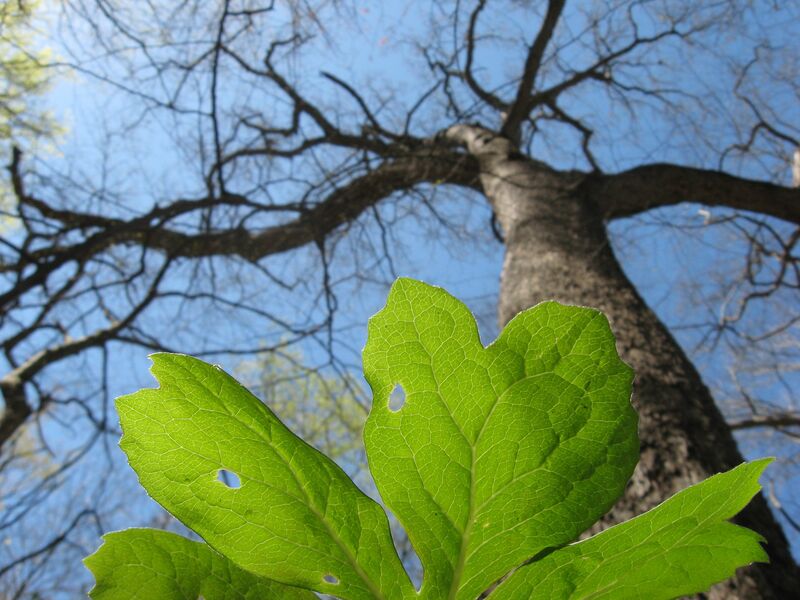 Here is a giant Oak tree, the biggest in Morris Park, surrounded by Mayapples. 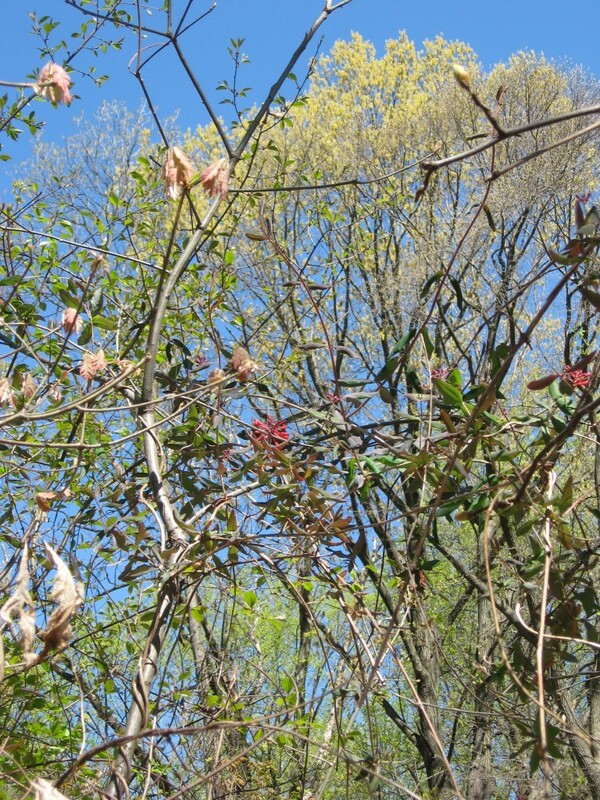 A most pleasant spring day in the forest. 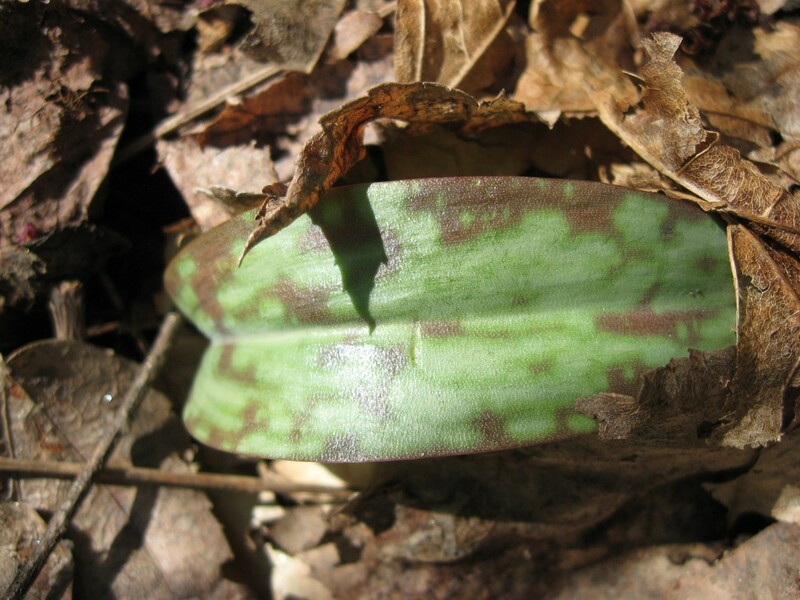 Come and visit Morris Park and keep an eye out for the Trout lilies. 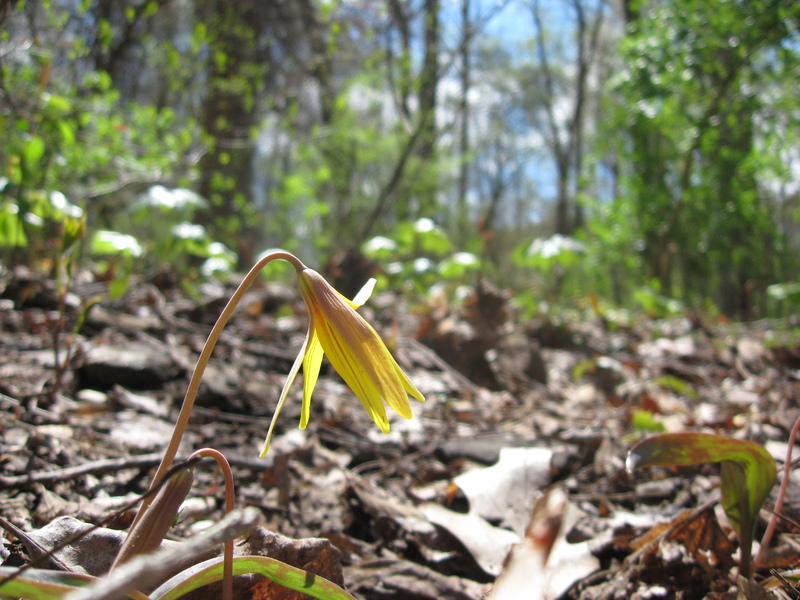 Here, a blooming Trout lily is growing alongside a Mayapple. 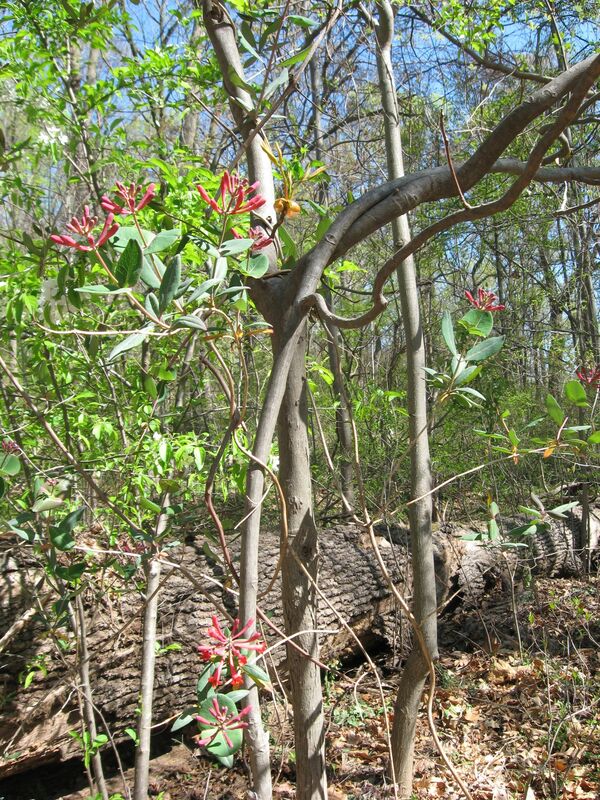 Many specimens do not flower in any given population and the leaves are very distinctive and interesting. Today, a special trip was made down to Indian Creek to visit the Trout lilies. Today there was only one bloodroot left blooming in the park. This year there were two full weeks of blooming Bloodroot, in contrast to last year, when there were four weeks of blooming.